Writing in today's USA Today, Bishop David Zubik, of the Catholic Diocese of Pittsburgh, asks why the Church should negotiate for religious freedom already guaranteed in the United States Constitution. 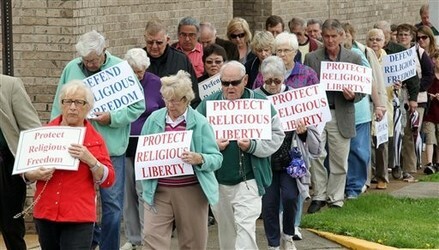 A protest in Belleville, Ill., against the contraception mandate. Last August, the Department of Health and Human Services issued a mandate requiring religious institutions to facilitate activities that violate their religious and moral convictions. The only church-sponsored organizations exempted are those that primarily employ and serve people of the same faith. This means that none of our social service agencies — hospitals, universities, free health clinics and soup kitchens — would be exempt. As the law now stands, church institutions must comply by August 2013. Despite President Obama's promise of some kind of "accommodation" to religious institutions, the mandate remains firmly in place. Should the church negotiate more before filing lawsuits? We already have. But what exactly can we negotiate when it comes to religious freedom already guaranteed by the Constitution? Why are we now forced to concede to the government religious freedom that has always been guaranteed by the Constitution? Much of the so-called accommodation is just smoke and mirrors, an accounting sleight-of-hand over who directly pays the tab. There's been no "accommodation" to broaden the very narrow so-called religious exemption. Church-related institutions will still be subject to the mandate. These lawsuits have nothing to do with politics. We did not pick this fight nor this timing during a presidential election year. The government chose to impose this on us now. In fact, the lawsuits take the issue out of partisan politics and place it before courts that exist to protect our constitutional freedoms. These lawsuits ask that religious freedoms be recognized and respected as they were before the mandate. The church cannot be forced to violate its own sacred beliefs. To do so starkly contradicts everything we have been taught and know about religious freedom in the United States. David A. Zubik is the bishop of the Catholic Diocese of Pittsburgh.